Communicating across cultures is often a challenge: it is easy to imagine that visualization can help us overcome linguistic barriers, but it can actually do much more! 2. Providing double cues: When the verbal or textual information is not clear, the visual element can support elaborations and understanding. differences, this explicitation is useful to convey ideas more clearly. 4. Surface misunderstanding: Visualization, thanks to its concreteness, can help to surface assumptions and misunderstandings by triggering an open discussion. 5. Prevent personal conflict: when ideas are mapped onto a visualization, participants can express their disagreement by referencing the idea visualized, rather than the person who proposed it. This advantage of visual mapping can be particularly useful in intercultural meetings in which the Power Distance of the participants’ culture is largely different. 2. Direction: In Arabic and in traditional Chinese language information is read from right to left. 3. Icons and symbols: a handshake symbolizes agreement only in the west. Fork and knife are perceived as an exotic symbol in Asia. 4. Humor: humour is culturally dependent. 5. Visual metaphors: sport metaphors are not understood in coutries where that sport is not practiced. 6. Focus of attention: Westerners focus on the main central objects at the expenses of the background, and Asians focus equally on the background as on the foreground (Nisbett, 2003). 7. 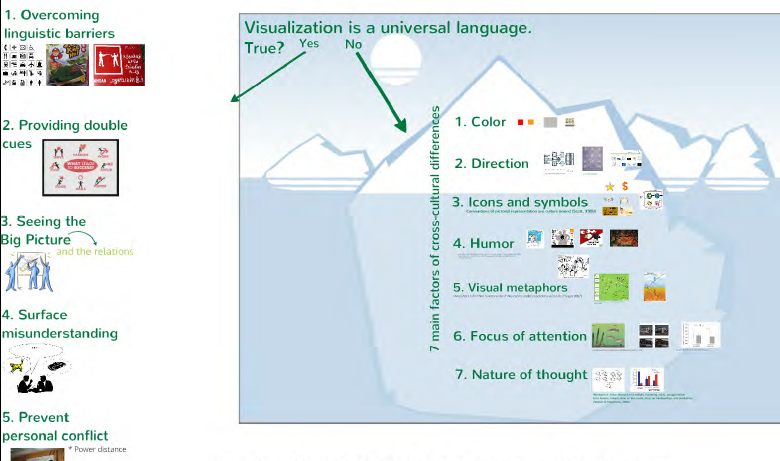 Nature of thought: Westerners prefer linear and analytical diagrams while Asians prefer more holistic types of visualizations such as visual metaphors. If you are interested in more details you can check out my recent publication: Bresciani, S. (2013). Organizational communication with visual mapping: Comparing East and West. In D. Ingenhoff (Ed. ), Internationale PR-Forschung. Konstanz: UVK Verlag. March 15th 2013 was the 200th anniversary of Dr. Snow’s birth, the doctor who used visual mapping and discovered the causes of cholera! As noted by the TED blog, the London School of Hygiene & Tropical Medicine is celebrating the anniversary with a series of events. What is so special about this map? Visualization expert Prof. Edward Tufte potrays the story and map of Dr. 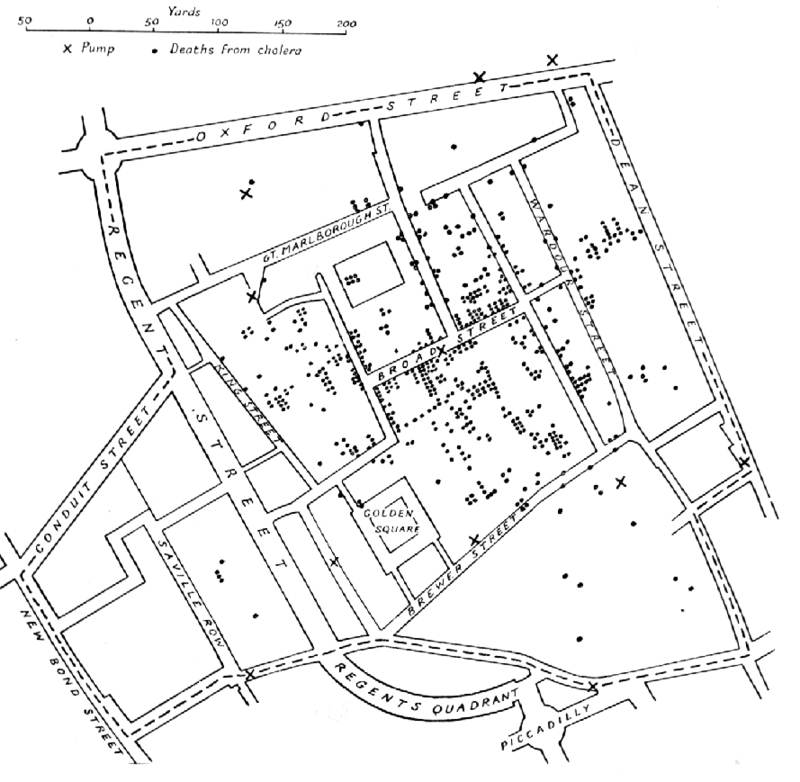 Snow discovery: in 1854 a cholera outbreak was devastating London and causing large number of deaths. He draw a map of the area and plotted the number of deaths with black lines.Do you see any trend? After mapping the water pumps location, it is quite asy to see that the deaths are concentrated around the Broad Street water pump. And Dr. Snow discovered, through the help of this map, that Cholera is not a viral disease as previosly thought, but is transmitted primarely by contamiated drinking water. The map helped to convince the authories about his theory and thus the handle of the waterpump was removed. The cholera epidemic soon ended. If you visit London, you can still see the incriminated water pump, which is closed since then, and visit the nearby “John Snow saloon”. You are currently browsing the Sabrina Bresciani blog archives for March, 2013.